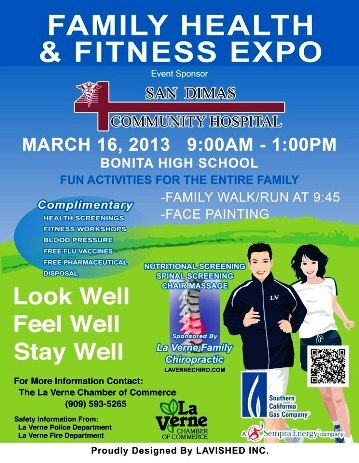 Family Health & Fitness Expo Comes to La Verne: On Your Mark, Get Set, Get Fit! It’s unlikely that First Lady Michelle Obama, the inspiration behind the “Let’s Move” movement, will be attending La Verne’s first Family Health & Fitness Expo on Saturday, March 16 from 9 a.m. to 1 p.m., but just about everybody else will be there. The brainchild of Dr. Afshin Mehr, owner of La Verne Family Chiropractic, the Expo on the Bonita High School campus will offer four full hours of healthy activities and events for the entire family to enjoy, from a fun run and walk to face painting to complimentary health screenings and fitness workshops. When Dr. Mehr first launched the idea for the Expo, he hoped the event would attract 30 exhibitors and sponsors. The current list is now at 47 and climbing. “I think we’ve been successful because nothing like this has been done in our community,” Dr. Mehr said. 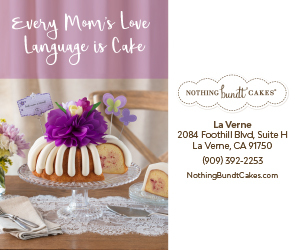 Once the city and La Verne Chamber of Commerce conferred their blessings, Dr. Mehr and his committee have printing flyers, hanging banners, contacting PTAs and planning the big event. “We’ve really touched all the bases,” Dr. Mehr said. “We’ll even be handing out vouchers for free mammograms and Pap smears. The 10 a.m. fun run and walk will follow the official welcome and kick-off at 9:30 a.m. and a brief warm-up at 9:45 a.m. conducted by fitness expert Derek Wohlers. Once the walkers and runners are cut loose, they will receive a raffle ticket for each circuit around the track they complete. At the end of the run, the raffle drawing will commence. If you don’t feel like walking or running, you can begin visiting any of the almost 50 exhibitors to get your blood pressure checked, spine screened or neck and shoulders massaged. Furthermore, if you have expired prescriptions, bring them to the expo for safe disposal. Although Dr. Mehr and his team will be providing many complimentary services, he might also be a recipient. He’s praying for blue skies. If he doesn’t get them, he might have to avail himself of the free blood pressure monitoring. “I’ve been checking the forecast every day, and it’s supposed to be clear,” he said. Joining main event sponsor San Dimas Community Hospital in supporting the expo are the La Verne Chamber, La Verne Police and Fire, Southern California Gas Company, Sempra Energy, Lavished Inc., Swiss Just, Rodeo Jewelers, Hillcrest, Express Cash, Kiddie Academy and Waste Management. For more information, please contact the La Verne Chamber at (909) 593-5265 or Dr. Mehr via his website at Lavernechiro.com. Rain or shine, get ready to get healthy!